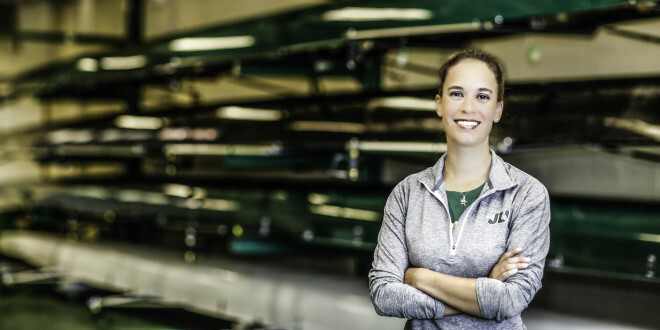 Robles’ three seasons as the women’s rowing assistant coach/recruiting coordinator at Gonzaga were highlighted by the program’s 2013 West Coast Conference Championship and inaugural bid to the NCAA Championship. The Varsity 4+, which she coached in 2013, won gold at the WIRA’s and WCC’s and placed 16th in the nation at the NCAA Championship. Under her coaching the Bulldogs also claimed first in the Varsity 4 at the WCC Championship as well as at the WIRA Championship in 2012. Prior to Gonzaga she spent two seasons at Georgetown serving as an assistant coach on the Hoyas rowing staff during the 2009-10 season and earning a promotion to varsity lightweight assistant coach in July of 2010. Under Robles leadership as varsity lightweight assistant coach, Robles developed Georgetown’s walk-on rowers into athletes that were able to contribute to the program in the EAWRC and IRA Championships. In the 2011 campaign at Georgetown, Robles coached the Varsity 4+ B to a first place finish at the Big East Conference Championship and the Varsity 4+ C to a second place finish. At the Eastern Sprints, her Lightweight 4+ placed third. Prior to Georgetown, she spent time at National Cathedral School in Washington, D.C., as the freshman coach. Robles, who went on to become a member of the Thompson’s Boat Center from 2006-07 as well as Riverside Boat Club from 2008-09, is a U.S. Rowing Level I certified coach.